During the long Easter holiday I’ve kept myself busy with a little pet project for my Raspberry Pi. So far I’ve been using the RPI as a small intranet server, DNS server and Proxy server. But it had plenty of room, both in RAM and storage, to do other things. As I had recently acquired a (dirt-cheap!) Android-based tablet, I was wondering if it would be possible to stream live TV directly to it. There are plenty of commercial solutions available, as well as some apps, that stream directly over the Internet. But, as I had mentioned, the tablet was dirt cheap and so it should be indicative of the amount of money I was willing to spend. I already owned a USB TV stick, which I used on my laptop, and wanted to use this as the receiver. It’s a PCTV Nanostick T2, based on the Sony CXD2820R demodulator, which is (or was?) the only device to support the UK’s DVB-T2 format for HD reception. The USB TV stick is directly supported by the 3.x kernel (as an em28xx device), and naturally, the RPI did too. So it was a matter of finding what software would stream from the TV source over the network, and what software that would be able to accept and display this stream — particularly on an Android device. This is where XBMC comes into play. 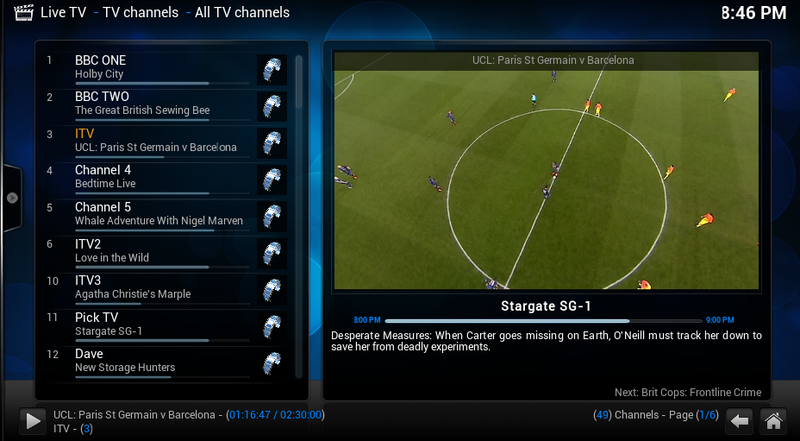 Since version 12 of XBMC (“Frodo”), it is now possible to watch live TV via a PVR back-end. What’s great too, is that XBMC runs on a plethora of operating systems and devices, including Android. The app is not yet available in the Google Play store, so you need to manually download and install it. Just note, that before you install it on your Android, you may need to enable the Unknown sources option found under the Android’s system settings (under the Security tab). Note! While the Raspberry Pi will detect the USB TV stick that is directly connected to it, it cannot provide enough power to it. This means it will not be able to tune into any channels. So the USB TV stick must be attached to a self-powered USB hub (which in turn is connected to the RPI, of course). So with the “front-end” sorted, all I needed was the back-end for the Raspberry Pi. I settled on using Tvheadend, because it is very lightweight and runs on the ARM device just fine. However, I didn’t install it from binary as, well, there wasn’t one available — at least not in individual form. Compiling is a breeze though, and the developers already have everything available for a .DEB package. I skipped building a .DEB package, simply for sake of simplicity, but used their init script, config files, etc. To compile Tvheadend, you start by getting the necessary packages. Some I will list here are optional, but I prefer to cram as much “optional” stuff into a build, so I won’t need to recompile everything it when I do need it at one point. After the packages have been installed, proceed to clone the source code of Tvheadend using git. This will create a directory called tvheadend based on the location where you are, generally /home/pi/ if you’ve logged in via SSH. Now proceed to the directory and run the initial configuration. Running the configuration will check if you have the required packages installed, and fetch DVB scan data from a remote server. If everything went well, you should not have received any fatal errors. You may see a few “fail” messages, but these are benign. As I live in the London area, the Freeview transmitter is Crystal Palace. However, the source from which the configuration obtains the DVB scan data appears to be slightly outdated and may cause some hiccups. In my case, I’ve simply provided my own scan data using the previously installed w_scan application. You may skip this, if it doesn’t apply to you. This will directly replace the file in tvheadend/data/dvb-scan/dvb-t/uk-CrystalPalace, so if you’re concerned, you may wish to make a copy first. The one thing that you should pay attention to, is the portion here it creates the /home/hts/.hts/tvheadend/superuser file. The username and password provided here are only for sample purposes, and you should change this to something you’ve thought up yourself. If you have a firewall setup on your RPI (and you should! ), remember to open up the TCP ports 9981 and 9982 for the appropriate network. UDP is not required. And configure it further at http://(ip address or domain name of your PI):9981. You will be prompted for a username and password, which was provided earlier in the superuser file. Some guidance for configuration can be found in XBMC’s Wiki — it does not mention that after you’ve selected DVB input, you should tick the box Enabled found in the Adapter Configuration box, and then save the settings before it will perform an initial scan. You can follow its progress by expanding the window at the bottom (click the chevrons pointing upwards in the bottom-right corner). Additionally, you need to setup the Access Control list, also found in the Configuration area, to allow/restrict access from devices. This is explained in more detail in the Tvheadend Wiki. Again, the important part here is the #401, changed from the previous #371. NOTE: If you still have all the original Raspbian bells and whistles installed, such as X-server/Gnome, then before you reboot the RPI, double check your available disk space.